Top quality is not reserved for exclusive country clubs. Some of Wyoming most amazing golf courses are open to the public. Whether you're a seasoned golfer or you're just giving it a go for the first time, Wyoming has a place for you to sharpen your swing. From Jackson to Casper, here are the 10 best public golf courses in the state. The Robert Trent Jones, Jr.-designed course at Jackson Hole Golf and Tennis Club is regularly selected as the top course in the state. Yes, the club is open to membership, but they also welcome the golfing public onto their course. A beautiful course with views of the Tetons: It doesn’t get any better. Club and cart rentals are available. Another stunning, semi-private course with Robert Trent Jones, Jr.-designed links is Casper’s Three Crowns Golf Club. Mountain views and eight lakes will make your round at Three Crowns a memorable experience. A restaurant and pro shop round out the experience and help you relax after 18 holes. Targhee Village is a nine-hole executive course, so it’s perfect for a quick round of golf if you’re in the Grand Teton area. Despite its size, this course is remarkable both for its reasonable greens fees and its spectacular mountain views. No wonder it’s the most venerable course in the Teton Valley. Buffalo Golf Club is a perennial among best public course lists in the Cowboy State. This small-town course has been voted the state’s best municipal course. The club is home to the Clubhouse Grille and Bar, offers league play, a pro shop, and has a resident golf pro. 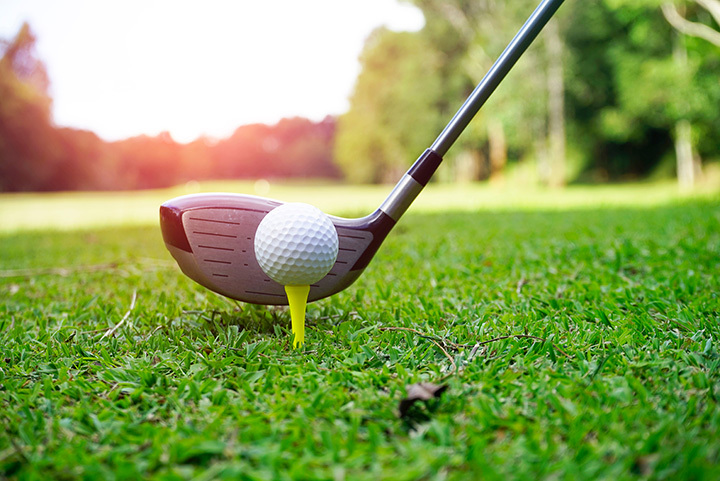 If you find yourself in the Rawlins area, in search of a golfing challenge, make your way to Rochelle Ranch, where you’ll find 18 holes, bunkers, and water hazards to test your skills. This picturesque course is a full-service facility, with a pro shop, practice facilities, and a bar and grill. Teton Pines is another gorgeous golf course with terrific Teton vistas. The heavily-wooded, Arnold Palmer and Ed Seay-designed course is challenging but still offers an enjoyable playing experience for golfers. Play a round and you’ll see why Teton Pines is regarded as some of the best mountain golfing in the United States. When you walk onto the 27-hole, White Mountain championship course, you will be hard-pressed to believe that you’re standing on a municipal golf course — especially after paying less than $50 for 18 holes of golf. Located at the Wataha Recreational Complex, the course has a pro on staff, as well as a full-service pro shop, a full-service restaurant, and a snack bar. Operated by Campbell County, Bell Nob is a par 72, 18-hole, championship golf course located just outside of Gillette. The course has a bar and dining area, as well as a pro shop, driving range, chipping area, and putting greens. Club rentals are available if you need them. Cheyenne’s Airport Golf Club—home to the annual Wyoming State Open—offers a 6,100-yard, par 70 course that, as the club says, “will put up a challenge to your game without hurting your ego.” The club has a bar and grill, a golf shop, and lessons. The nearby Prairie View course is a great option if you don’t have time for a full 18 holes. While the gorgeous course at The Golf Club at Devil’s Tower is not open to the public, per se, the club offers “member for a day” options if you’d like to play the course and experience the facility. One option includes a night’s stay at one of the course’s signature properties.